The Basel Declaration have called for a show of solidarity with researchers at the University of Milan who had years of work destroyed when animal rights activists broke into the facility. See previous two links for more background information. Please sign this call of solidarity and share the link. on Saturday April 20, 2013, a research animal facility of the University of Milano and the National Institute of Neurosciences got devastated by animal rights extremists. Mice requiring special care were abducted and a large number of invaluable and long-term experiments to study neurological diseases for which no cures exist such as Autism, Alzheimer’s, Parkinson’s and others were destroyed due to these senseless acts. As we are a 100% grass-root organization, we critically depend on your forwarding this email to your friends and colleagues and asking them to pledge their support as well. 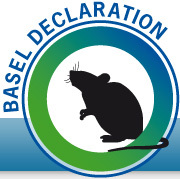 Simply ask them to go to http://www.basel-declaration.org/call-for-solidarity/ and sign! I would like to thank you for your support and forwarding this email to others! Posted on April 29, 2013 by EditorPosted in News, Outreach NewsTagged animal rights activists, Basel Declaration, lab raid, University of Milan. Next Next post: A new drug to treat type II diabetes: Thank the…Gila monster? More than 2,000 people have signed the petition already! That’s a great start! !